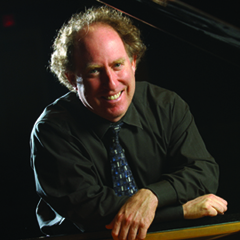 Acclaimed pianist Jeffrey Kahane joined the USC Thornton Keyboard Studies faculty part time in 2015 and became a full-time professor in 2016 following a 20-year run as music director of the Los Angeles Chamber Orchestra (LACO), the longest of any music director in the ensemble’s history. Equally at home at the keyboard or on the podium, Kahane has established an international reputation as a truly versatile artist, recognized by audiences around the world for his mastery of a diverse repertoire ranging from Bach, Mozart and Beethoven to Gershwin, Golijov and John Adams. Since making his Carnegie Hall debut in 1983, Kahane has given recitals in many of the nation’s major music centers including New York, Chicago, Boston, San Francisco, Los Angeles and Atlanta. He appears as soloist with major orchestras such as the New York Philharmonic, Cleveland Orchestra, Los Angeles Philharmonic, Philadelphia Orchestra and the Toronto and San Francisco symphonies and is also a popular artist at all of the major U.S. summer festivals. Kahane made his conducting debut at the Oregon Bach Festival in 1988. Since then, he has guest conducted many of the major US orchestras including the New York and Los Angeles Philharmonics, Philadelphia and Cleveland Orchestras, Saint Paul Chamber Orchestra, and the Chicago, Detroit, St. Louis, Baltimore, Indianapolis and New World symphonies among others. Currently in his 20th season as Music Director of the Los Angeles Chamber Orchestra, Kahane concluded his tenure as Music Director of the Colorado Symphony in June 2010 and for ten seasons was Music Director of the Santa Rosa Symphony, where he is now Conductor Laureate. He has received much recognition for his innovative programming and commitment to education and community involvement with all three orchestras and received ASCAP Awards for Adventurous Programming for his work in both Los Angeles and Denver. Recent engagements include appearances at the Aspen, Caramoor and Blossom festivals; concerto performances with the Toronto, Houston, New World, Colorado and Oregon symphonies among others; play/conducts with the San Francisco, National, Detroit, Vancouver, Indianapolis and New Jersey symphonies and the Rochester Philharmonic, as well as for the third time in four seasons with the New York Philharmonic; and conducting the New England Conservatory Symphony Orchestra in Boston, the Juilliard Orchestra at Lincoln Center and the National Repertory Orchestra in Colorado. Kahane’s recent European engagements include play/conduct programs with the Camerata Salzburg, Hamburg Symphony and the Real Philharmonic de Galicia in Spain, as well as appearances at the Meck-Pomm Chamber Music Festival in Germany. Kahane has recorded for the SONY, EMI, Telarc, RCA, Nonesuch, Deutsche Grammophon, Virgin Records, Decca/Argo and Haenssler labels in collaboration with the New World, Cincinnati, Bournemouth and Oregon Bach Festival symphonies, as well as works by Gershwin and Bernstein with Yo-Yo- Ma, the complete works for violin and piano by Schubert with Joseph Swensen, and Bach concertos with LACO and Hilary Hahn. A native of Los Angeles and a graduate of the San Francisco Conservatory of Music, Kahane’s early piano studies were with Howard Weisel and Jakob Gimpel. First Prize winner at the 1983 Rubinstein Competition and a finalist at the 1981 Van Cliburn Competition, he was also the recipient of a 1983 Avery Fisher Career Grant. An avid linguist who reads widely in a number of ancient and modern languages, Kahane received a Master’s Degree in Classics from the University of Colorado at Boulder in 2011. He resides in Los Angeles with his wife, Martha, a clinical psychologist in private practice. They have two children – Gabriel, a composer, pianist and singer/songwriter and Annie, a dancer and poet.